18th Annual AES Superfest Hamfest Milwaukee, Wisconsin was held March 31, 2012. Amateur radio equipment manufactures, Amateur Radio Relay League (ARRL), Military Auxiliary Radio System (MARS), Emergency Services and Disaster Agency (ESDA), American Red Cross and local ham radio clubs were there with booths and exhibits. Ham radio operators from Wisconsin and surrounding states attended the one day event. Volunteer examiners (VEs) were on hand with FCC tests for those so to be new hams and hams upgrading their licenses. 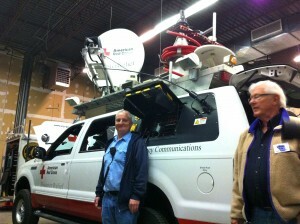 The American Red Cross and other disaster preparedness agencies displayed their emergency response equipment including radios. It was a full house at AES for their annual Superfest!